For some people, “alfalfa sprouts” and “flaxseed oil” make them feel young. For others, it’s the appalling duo of “wheatgrass shots” and “bone broth.” But Betty White doesn’t subscribe to the Goop cult of thinking. All this sprightly nonagenarian needs is meat and alcohol — and lots and lots of it. Recently asked how she’s managed to live such a long and fulfilling life with minimal health issues, the 95-year-old said it boils down to always indulging in vodka and hot dogs: “Probably in that order.” (Never a more appropriate time for a Yas, queen!) White also gave a few tips on how to enjoy life in this dumpster fire we call the postmodern world. “Accentuate the positive, not the negative,” she said. 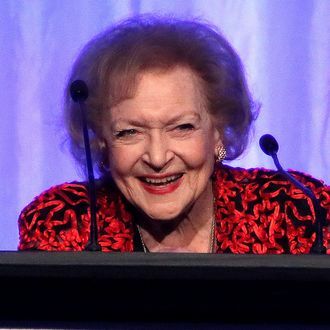 “It sounds so trite, but a lot of people will pick out something to complain about, rather than say, ‘Hey, that was great!’ It’s not hard to find great stuff if you look.” In the spirit of that, Hey, this aggregated article was great and we love Betty White so much.